Christmas is a joyous time of year filled with happiness and great mirth, and should be fun for all the family- pets included. While Christmas is surrounded with joy and cheer, it can in fact inadvertently have a profound negative effect on our pets. 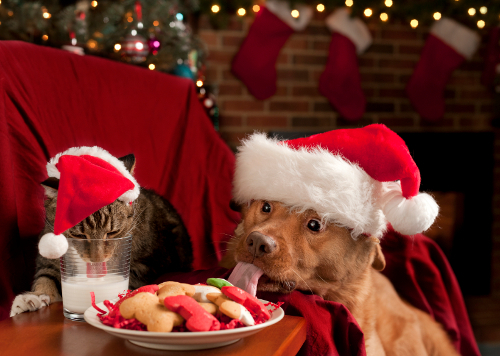 Many Christmas left overs and food items are toxic and can cause serious illness to our pets, so it is important to take caution when choosing which treats to give to your pets over the holiday season. Cooked bones and cured meat can play havoc with intestines. Inflammation of the pancreas can be a result of feeding your pet rich meats, stuffing and crackle. Cooked bones can splinter and perforate the oesophagus, stomach or intestines, causing blockages along the digestive tract. Rich foods that are high in fat cause the pancreas, an organ near the stomach which produces digestive enzymes, to go into overdrive. The result is pancreatitis, the swelling of the dog's pancreas which can have long-term consequences. Fatty foods or table scraps such as turkey skin or pan drippings, gravy, bacon or sausages should be avoided. Onions, avocados, chocolate, nuts and grapes in particular are on the no-go list. All of these foods can be responsible for damage to the heart and lungs, gastric irritation and anaemia. They can cause a range of symptoms including loss of appetite, vomiting, diarrhoea, severe stomach pain and even collapse. Chocolate can cause vomiting, diarrhoea, muscle twitching, increased urination and excessive panting. Chocolate contains a chemical called theobromine, which can’t be metabolised by animals as well as humans, accumulating to become toxic or even fatal. Xylitol is a more lethal agent for pets than chocolate so avoid sharing store-bought desserts or anything else artificially sweetened with xylitol. This artificial sweetener can cause acute and life threatening low blood sugar as well as liver failure in pets. Any sweet treats or leftovers containing alcohol are quite toxic to animals as their sensitivity to alcohol is above that of humans. While our pets are much-loved members of our families, it is important to resist that urge to give them scraps or even a Christmas dinner served into their bowl. It is not just Holidays I worry about. I would love ideas for dog treats.